To the rear of the site at ground level (which runs parallel with Pin Lane off South side street) are the toilets and kitchens along with existing external escape stairs. There is also a small staff car park in front, which is accessed of Pin Lane. These existing outbuildings are a bit of an eyesore in appearance with escape stairs, incongruous multiple flat roof areas and large flues, largely representing a carbuncle. The proposal is to build above the existing w.c's and kitchen – creating a concrete tabletop platform for the structure to sit on. Above this platform shall sit a three storey contemporary design residential block. Each floor shall represent a self - contained apartment (Three in total). 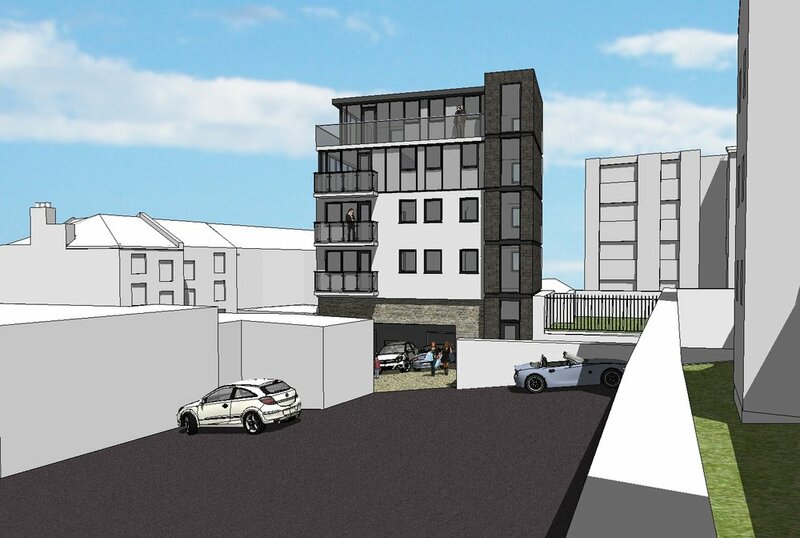 The existing car park shall become an undercroft, which shall have refuse and cycle storage as well as car parking.